Every time I purchase items from Sephora I make sure to get the best sample kit possible for two reasons. One of the reasons is because I love getting extras. Having samples, especially deluxe ones, lets me have products that I can comfortably fit in my travel makeup bag that will actually be used like mascara, moisturizers and glosses. The second and most important reason that I love getting tons of gift with purchase samples is because it gives me a chance to try out some products that otherwise would get lost in the shuffle due to there being hundreds of products that I look at on an almost daily basis. My latest Sephora purchase came with A Bright Night Out which is a 9 piece deluxe sample kit that came in a super cute cherry red makeup bag. I had the option of getting a different kit but opted for this one because I needed a new eyeliner to try out, wanted to check out Pharrell's Girl perfume, am recently trying to get back into wearing red lipstick and because I adore adore adore Chloe. It was a winning choice for sure. The main reason why this drew my attention was that I realized I needed a shadow primer to help my ELF and Wet 'n Wild shadows stay on longer and a big Smashbox 24 Hour Photo Finish Shadow Primer was also included. This primer is on par with the others that I've used before because it's got a great consistency and stays put within minutes of applying which is only a bad thing if you don't set it immediately after applying it. So now, about two months after receiving these goodies I'm ready for my next Sephora purchase. I need to get a move on it in order to maintain my VIB Rouge status with them and I know exactly what I'm going to purchase: Kat Von D's Everlasting Liquid Lipstick in Bachelorette, Urban Decay's 24/7 Velvet Liner in Black Velvet and Philosophy's Loveswept Body Lotion. I'm glad these of those items were included in the kit because I don't know if I ever would have gotten around to them otherwise. 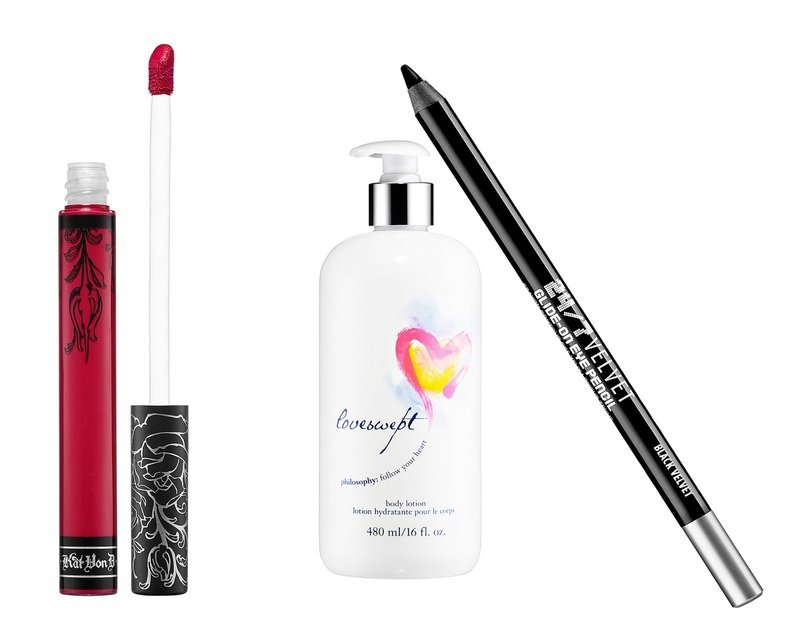 Along with Kat Von D's lipstick the kit also included a red gloss by Marc Jacobs Beauty that I adore and will most likely purchase when I'm ready to get some more glosses and Lancome's mascara if after giving it a fair shot against my current obsession: They're Real by Benefit. I'm so excited to get the full versions of some of the things I was able to try out and can't wait to discover new products thanks to these sample kits. Trying things out at my own pace is so much better than doing it at the store where I can easily forget which shade or scent I tried on.